Kenya, Nigeria and South Africa have joined a group of professional leagues to create a World Association of Leagues following a meeting in Paris on Tuesday. The trio join 20 other leagues, including the English, French and Spanish top flights, with the intention of working alongside football's world governing body, Fifa. 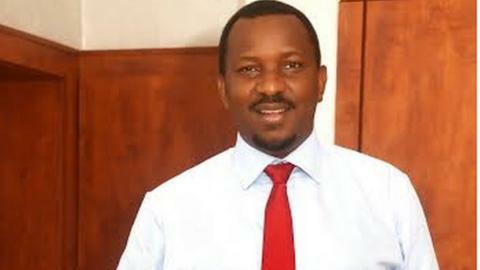 Nigeria Professional Football League (NPFL) chairman Shehu Dikko (pictured) believes there are exciting times ahead. "There's a general consensus that the leagues are a fundamental part of football, obviously the clubs, players and referees are all from the leagues," Dikko told BBC Sport. The meeting was good for football and for all of us [Fifa presidential candidates] hoping to change the face of Fifa. Without the leagues there is no football and the people here are managing football daily in their countries, so they come with a wealth of experience. French Professional Football League (LFP) president Frederic Thiriez announced that the new association will come into effect in January. It will only feature leagues who are independently run by bodies separate from their national football federations. Dikko believes that the new body should have a hand in the ongoing reforms in Fifa. "The leagues control 90% of football, therefore whatever decisions and reforms are going on in world football, the professional leagues want to participate in the rebuilding of Fifa and football institutions," he added. "This gives us a chance to speak with a single voice on issues of common concern and from what we've seen here, it is clearly exciting times ahead for football going forward." The second World Leagues Forum in Paris was attended by four of the five candidates in the running to take over the Fifa presidency from suspended incumbent Sepp Blatter. South African business tycoon Tokyo Sexwale, Prince Ali bin Al Hussein of Jordan, ex-French diplomat Jerome Champagne and Asia's football boss Sheikh Salman bin Ebrahim Al Khalifa were the four Fifa candidates present. Only Uefa's general secretary, Gianni Infantino, did not attend the forum. "As Africans and being part of this powerful group, we would love to see a Fifa where the league forum is a key stakeholder and decision maker in what is happening there," Dikko added. "The five Fifa presidential hopefuls now understand that there must be a good working relationship between the league forum and Fifa at world level, the league and confederations at continental level. "We are hopefully going to see a new structure of world football that will give the game a beautiful face again." Kenya Premier League chief executive officer, Jack Oguda, says that beyond building a working relationship between the leagues, African countries will benefit immensely from the strong steps taken in Paris. Oguda told BBC Sport: "The opportunity [to have a united body] is great. Imagine the world leagues coming together to discuss a sole solution to synchronising our leagues for the 2022 World Cup in Qatar. "The first forum in London gave us an insight into the challenges that other leagues face. "What we have seen here in Paris is a great platform to make the game more beautiful than what it has been in the last few months. "Africans cannot afford to simply sit back but play a significant role in world football. We are all happy with the steps taken and the doors this gathering will open for football on the continent."